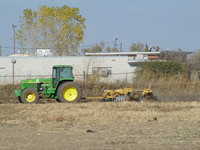 RSC has provided support services for land farming operations. As sites remediate contaminated soils, land farming is often the most cost effective and preferred remediation technology. Tilling soils to promote aeration, microbiological activity, and contaminant removal through natural evapo-transporation is often employed. RSC has assisted by providing the equipment and labor for LTUs (Land Tilling Units) . This includes both tilling and adding nutrients (fertilizer) for increased microbiological activity.